Napoleon reviewing his mounted troops. Courtesy of the Library of Congress. In the Napoleonic system, the army’s mounted arm took multiple forms. There were: carabiniers, cuirassiers, dragoons, hussars, chasseurs, and lancers. Each had its own specific mission. Carabiniers were armed with dragoon carbines and sabers, and largely acted as dragoons. Cuirassiers were the elite troops of Napoleon’s army. They were large, imposing men who wore body armor and carried sabers, carbines, and pistols. They were heavy cavalry, used to deliver the decisive blows in infantry engagements. Dragoons were trained to function both mounted and dismounted. They carried sabers, carbines, and pistols, and could fight equally well mounted or dismounted. Hussars were light cavalry, used best for scouting and raiding. Chasseurs were a cross between dragoons and hussars, and could perform either role. Finally, lancers carried lances, which were a terror weapon. Each branch of the French mounted service had its own mission, and they were used as such. The United States Army did not have all of those classes of mounted troops. The antebellum army had two regiments of dragoons, a regiment of mounted infantry, and two regiments of light cavalry. The 1st Dragoons were formed at the Jefferson Barracks in March 1833. They performed frontier duty and fought in the Mexican War. Led by Brig. Gen. Stephen Watts Kearny, a legendary dragoon, the First Dragoons were known for their long hair and dashing valor. In May 1836, a second regiment of dragoons was formed. They fought against Seminole Indians in Florida, in the Mexican War, and on the frontier. Legendary officers to serve in the Second Dragoons included William S. Harney, Henry H. Sibley, David E. Twiggs, Philip St. George Cooke, John Buford, Wesley Merritt, and others. The dragoon regiments carried carbines and sabers. They were trained to fight effectively mounted as well as dismounted. The Regiment of Mounted Riflemen was formed in May 1846. These men were typically armed with long barreled rifle-muskets and did not usually carry typical cavalry weapons like sabers. They used their horses to move from place to place and then fought dismounted like infantry. They served in six campaigns of the Mexican War, and then on the frontier. The First Cavalry Regiment—traditional light cavalry—was formed at the Jefferson Barracks in 1855. These men were trained to perform the traditional role of cavalry—scouting, screening and reconnaissance—and carried sabers, carbines, and pistols. These men were supposed to perform the same duties as the hussars. They served in “Bleeding Kansas” and on the frontier. Famous soldiers to come out of this regiment included Edwin V. Sumner, Joseph E. Johnston, Robert E. Lee, J.E.B. Stuart, and George B. McClellan. In 1855, a second regiment of light cavalry was authorized and formed. The Second Cavalry Regiment was an “all-star” team: Its officers included 12 future Civil War generals: Albert Sidney Johnston, Robert E. Lee, George H. Thomas, William J. Hardee, Earl Van Dorn, Edmund Kirby Smith, George Stoneman, Kenner Garrard, Nathan G. Evans, William B. Royall, Fitzhugh Lee, and John Bell Hood. They made their fame fighting Comanche Indians in Texas in the pre-war years. 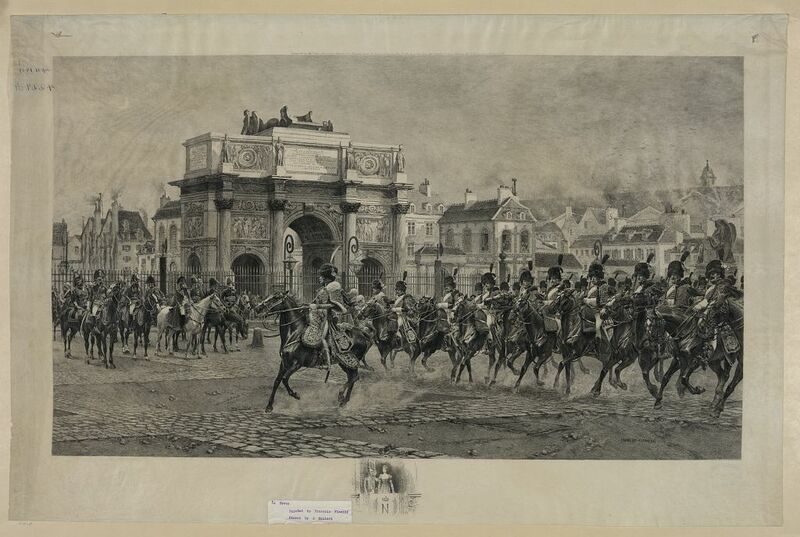 The First and Second Cavalry Regiments were truly hussars in the French mold. They excelled at scouting, screen, and reconnaissance, and they performed the role of hussars. With the coming of the Civil War, in August 1861, the War Department chose to eliminate the distinction between the dragoons, mounted rifles, and light cavalry. All units were re-designated as cavalry, and all units were re-numbered based on their seniority. As the oldest mounted unit, the 1st Dragoons became the 1st U.S. Cavalry. The 2nd Dragoons became the 2nd U.S. Cavalry. The Regiment of Mounted Riflemen became the 3rd U.S. Cavalry. The 1st Cavalry became the 4th U.S. Cavalry. Finally, the 2nd Cavalry became the 5th U.S. Cavalry. A new regiment formed in the summer of 1861, originally designated the 3rd Cavalry, was then re-numbered as the 6th U. S. Cavalry. Thus, the distinctions that marked both the Napoleonic mounted arm and the early days of the U.S. Army were eliminated. Weaponry was standardized, and so were the tactics. The United States Army’s cavalry was about to begin its evolution in earnest with the coming of Civil War. 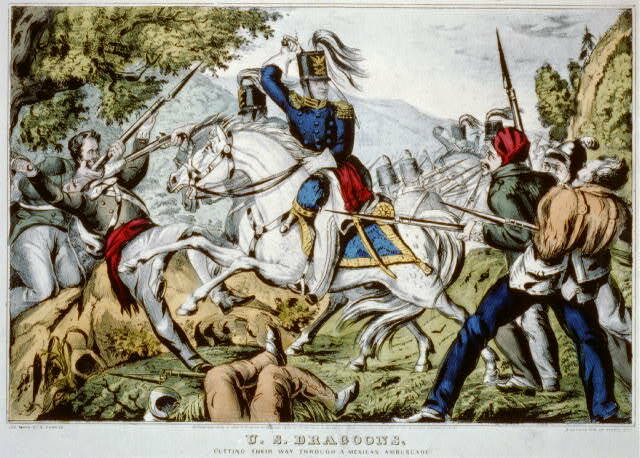 U.S. Dragoons in the War with Mexico. Courtesy of the Library of Congress. This entry was posted in Armies, Arms & Armaments, Cavalry, Common Soldier, Emerging Civil War, Leadership--Confederate, Leadership--Federal, Personalities, Ties to the War and tagged 1st U.S. Cavalry, 1st U.S. Dragoons, 2nd U.S. Cavalry, 2nd U.S. Dragoons, 3rd U.S. Cavalry, 4th U.S. Cavalry, 5th U.S. Cavalry, 6th U.S. Cavalry, Albert Sidney Johnston, Bleeding Kansas, David Twiggs, Earl Van Dorn, Edmund Kirby Smith, Edwin Sumner, Fitzhugh Lee, French Carabiniers, French Cuirassiers, French Dragoons, French Hussars, George H. Thomas, George McClellan, George Stoneman, Henry Sibley, J.E.B. Stuart, John Bell Hood, John Buford, Joseph Johnston, Kenner Garrard, Napoleon, Nathan Evans, Philip St. George Cooke, Regiment of Mounted Rifleman, Robert E. Lee, Stephen Watts Kearny, The-Evolution-of-Cavalry-Tactics, Wesley Merritt, William J. Hardee, William Royall, William S. Harney. Bookmark the permalink. Didn’t European dragoons carry a straight sword, as opposed to the curved saber? Did the US dragoons carry the same type of straight sword, or was it always the saber? My understanding was that the dragoon sword was heavier than the cavalry saber.